Ted Orland & Alan Ross will be together again to co-lead this exciting Carmel/Big Sur workshop. The workshop will be focusing on “Expressive Photography.” An expressive photograph is the ultimate blend of vision, passion and craft, and the secret to creating one is not in the tools or technology you use, but in knowing how to see, interpret and express. In this hands-on inspiring workshop—open to photographers at all levels—the emphasis will be on mastering those photographic concepts and the techniques essential to the creation of a more expressive image that represents your vision. 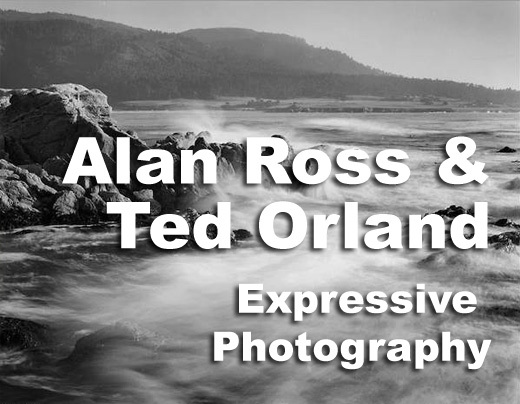 Under the guidance of long-time Ansel Adams assistants and master photographers Ted Orland & Alan Ross, you will learn how to isolate and evaluate the elements of a scene, translate the literal into the expressive, and use optics and exposure to best effect. Visits to Point Lobos, Big Sur and some of the Monterey Peninsula’s most picturesque locations will provide inspiration and opportunity, with demonstrations, practice sessions and critique, laying the foundation for your individual photographic advancement. By the end of the workshop, you will have the tools and methodology you need to respond to your vision with confidence. Digital Photographers: Please bring a laptop if you have one.